Small geometrical errors in the printer (e.g. mismatched arm lengths, or carriages slightly rotated about their faces or the Z axis) cause position errors. The effect of some of these errors increases with arm length but reduces with arm spacing. Also longer arms make the assembly less rigid, wider spacing makes it more rigid. That's why I suggest that longer arms be more widely spaced. However, you could try keeping your existing effector and carriages and upgrade them later if the narrow spacing seems to be causing problems. Thanks for the explanation. I am going to be using 6mmX8mm carbon fiber tubes which I gather should be rigid enough for 500mm or so arms so I think I will try using my existing carriages and effectors when I get to that point. I will probably still figure the arm length and side rail lengths as if the effector was larger just in case at the cost of a little Z height. I am experimenting as well. The following arm ends are untested; they could be more rigid. https://www.thingiverse.com/thing:3376860 I am using 10od/8id carbon fiber arms. I have 500mm carbon fiber rods in stock (which arms coming to 590mm and 400mm tubes on order. I am going 40x40mm offset to accommodate linear rails. That choice is creating lots of concerns because there is nothing in the aftermarket for 4040. I got a feeling it may take me (a) months of playing around to get my build to a final state. 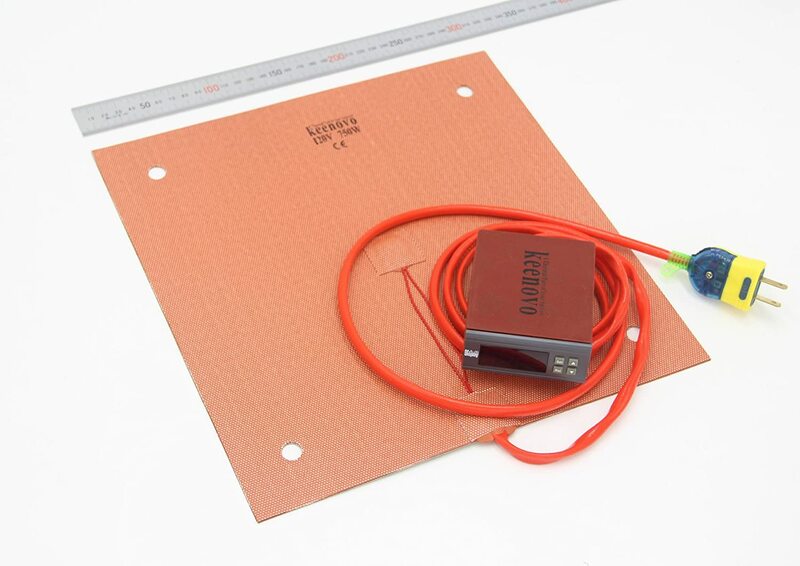 Before I order the steppers recommended by David in his blog BOM https://www.omc-stepperonline.com/nema-17-bipolar-09deg-46ncm-651ozin-2a-28v-42x42x48mm-4-wires-17hm19-2004s.html I wanted to check if there are any better ones to use with the Duet since that was posted. For the thermal I am looking at NTE8167 with a cutoff of 170C holding of 146C or NTE8149 with a cutoff of 152C holding of 128C. 110C would be the highest I would set the bed at so I didn't know if the 128C holding would be a high enough margin or not. Both are 15A. For the SSR I'm looking at a Crydom 50A 660V H12WD4850G-7332. Crydom seems to be a major brand and what got my attention is they have independant lab analysis of MTBF and is reasonably priced at US $23 to my door. I'd rather pay a little more for quality and over engineering my needs. Anyone confirm the company's reputation? @wepollock I have some 3.6 permanent magnet steppers in NEMA 17 and 34 sizes that are incredibly fast due to the low inertia and have wondered just how much of a real world difference it would make printing using them for axis motors. I use the 17's for extrusion motors with my Nimbles. The 34 size are a little out of the Duet current range and would probably require external drivers for reliable operation. Re TCO: Best I can tell by reading different manufacture sites is the NTE8149 with a cutoff of 152C and holding of 128C would be preferable over the higher temp one. The 128C holding is based on 168 hours continuous and the max temp that is specified is worst case cutoff scenario which is 176C vs 300C for the next higher temp NTE8167. My current 250mm delta has 2020 corners with 1m verticals and I get great results with it. I figured meticulous assembly as I did with the 250 and going to 2040 1.5m verticals and 2040 top horizontals with 2040 and 2020 bottom horizontals accompanied with a bottom plate (and I thought about a top plate) would be at least as rigid. I have decided to most likely go ahead and increase arm spacing to 80mm. The 500mm CF tubes have arrived and they seem more rigid than the premade 330mm ones from Trick Laser. I second guessed myself using 6mm belt with the longer verticals and have 9mm wide belt and pullies ordered. Do you think I will need cross bracing or other structural improvements or is it simply a matter of geometrical error due to longer extrusion? VBD (Very Big Delta) Questions and Request for input. 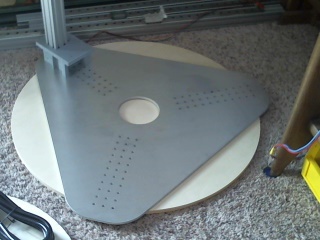 I designed a Delta Cheese Plate - it's going to let me adjust the delta radius based on performance. I can move the extrusions from 500 inward as needed. The delta cheese plate is rock solid with 40x40mm extrusions. 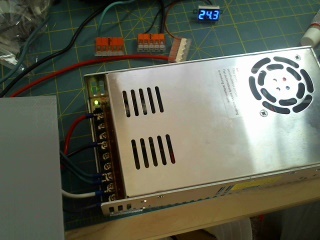 I wired up my power supply, and I noticed that DC is not grounded. Should I hook up negative DC to Green ground (which is mains ground)? I have the DC cables terminated in Wago connectors.. Should I jump ground from my negative wago to green? Should I hook up negative DC to Green ground (which is mains ground)? This is generally suggested for safety reasons. The frame and ideally the motors should also be grounded to earth. Note: it is highly recommended that the stepper motor casings be grounded, especially in belt-driven printers. Otherwise, motion of the belts causes static charge to build up, which eventually arcs over to the windings. If the motors are screwed to a metal frame, grounding the frame is sufficient. Do you plan on mains powered heat? If so you should for sure ground everything metal that you can. 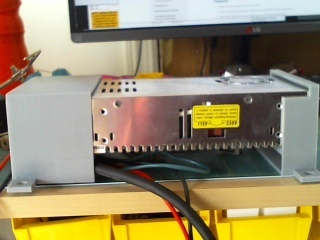 DC should also be ground referenced but over many years tinkering with electronics I have run into a couple of odd ball power supplies that didn't like it. I would not use Wago's for anything that carries more than a handful of amps and even then have them in a fire rated box, but that's just me. I do go ahead and use the ones that come in the junction box of recessed can lights but others cut them out. I'd never use them for branch circuit wiring. Just got done with my arms and took the jig apart. Now to open up the box from Open Builds that arrived. I checked out your monster delta.. WOW.. I plan to go wide not tall. Once I get wide where I want it I can then decide if I want to go tall. It would be great if you could post more pics! I see you have a hex design? The bed is "mostly" an afterthought at this time because I don't know what that the final geometry of the printer will be. I want to get a rigid platform first, then get the arms on, check if everything is level. I have two sets of arms in development. Once the geometry is solidified I will do initial testing w/o a heater. --The Wago 221's are rated to 20 amps.